The United Nations made a call Friday for Venezuela’s National Constituent Assembly (ANC) elections to be respected following two days of violent unrest that claimed seven lives across the South American country. “The wishes of the Venezuelan people to participate or not in this election need to be respected. No one should be obliged to vote, while those willing to take part should be able to do so freely,” a spokesperson for the UN High Commissioner for Human Rights said in a press briefing. During the press conference, the international human rights watchdog additionally called on Venezuelan authorities to “guarantee people’s rights to freedom of expression, association and peaceful assembly”, likewise urging “those opposing the election and the Assembly to do so peacefully”. The Maduro government’s bid to convene a citizens’ assembly to draft a new constitution as a solution to the current political standoff has drawn harsh rebuke from both the country’s right-wing opposition as well as foreign governments, including Washington, which has threatened “strong and swift economic actions” if Sunday’s vote goes ahead. On Wednesday, the Trump administration slapped sanctions on 13 top Venezuelan officials involved in organizing the ANC. The UN statement comes on the heels of a two-day national strike called by Venezuela’s right-wing opposition coalition, the MUD, as part of an effort to derail Sunday’s ANC vote. While the strike went generally unheeded nationally with the majority of the population going about their daily business, the call to action did spark pockets of violent confrontation between demonstrators and authorities. In Merida state, the Public Prosecution (MP) is investigating the death of Rafael Balsa Vergara (30) during a protest in Ejido on Wednesday afternoon. The cause of death is disputed with local opposition-aligned press accusing the National Guard of firing at point blank range, a version of events authorities have denied. Elsewhere in the Andean state, police officer Oneiver Quiñones Ramirez (30) was shot in the head while attempting to clear a street barricade at midday on Thursday, according to the MP report. The state police officer was hospitalized and died in the early hours of Friday morning. 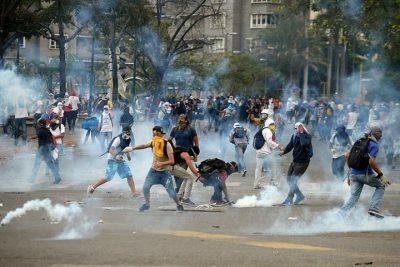 One National Bolivarian Police officer and a National Guard sergeant were also suffered gunshot wounds while attempting to disperse violent protests in Caracas Thursday. In the northern Merida town of Timotes, the MP is investigating the fatal shooting of Enderson Caldera (24) during violent clashes between opposition militants and authorities on Wednesday, which saw the latter set fire to the town hall and local police headquarters. Meanwhile in Carabobo state, opposition supporter Leonardo Gonzalez Barreto (49) was reportedly shot by local police in the vicinity of a protest on Thursday. The officers suspect in the case have been arrested by Venezuela’s special investigative police, the CICPC, and are awaiting charges. In the Lara municipality of Cabudare, a state prosecutor has also been commissioned to investigate the killing of Jose Miguel Pestano (23) during confrontations between anti-government protesters and authorities on Thursday. Further details concerning exact cause of death have yet to be made available. In the northeastern state of Anzoategui, Rafael Canache (28) was shot dead in a looting, according to the MP. At least 14 people have been killed in lootings across Venezuela since April. Lastly, in the greater Caracas region of Petare, 16-year-old Jean Carlos Aponte was fatally wounded during a demonstration in the 5 de Julio neighborhood on Thursday. A Caracas district attorney has been dispatched to investigate. 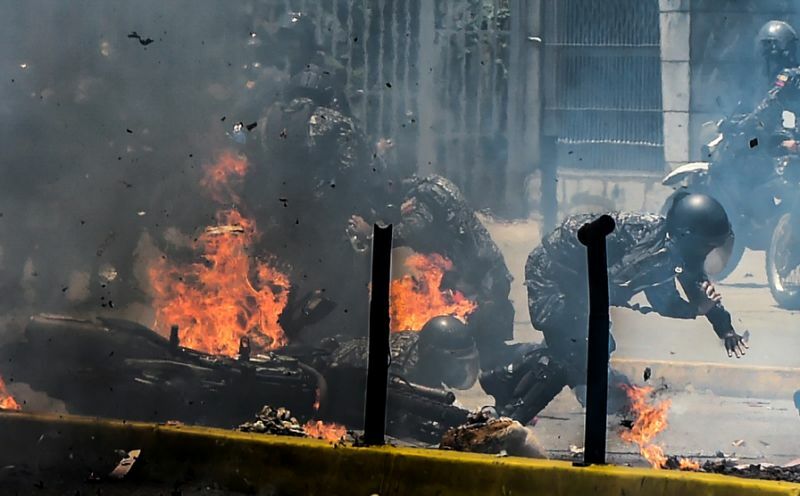 The latest fatalities bring the total death toll in 17 weeks of anti-government to 115, including at least 14 deaths at the hands of authorities and 29 attributable to opposition political violence. In response to the latest round of anti-government mobilizations, Interior Minister Nestor Reverol announced a temporary ban on public protests aimed at interrupting Sunday’s vote, deploying 146,000 national police officers to voting centers across the country. The Venezuelan government has decreed all voting centers temporary special protection zones and any action aimed at deterring people from voting will be punished with 5 to 10 years jail time. Despite the temporary ban, the opposition has called on its supporters to take to the streets Friday, Saturday, and Sunday in order to prevent the controversial vote from taking place. Featured image is from daily-sun.com.